© Clo’e Floirat / cloefloirat. Art Brussels is pleased to announce the participants of its 34th edition—the first to take place at the fair’s spectacular new location, Tour & Taxis, a turn-of-the-century former Customs House situated in Brussels’ inner city area. The 2016 edition brings together 140 galleries from 28 countries in three main sections. The International Committee and Discovery Committee have selected 31 newcomers in the fair. A new section, REDISCOVERY, which plays a significant role in the development of the fair’s existing “discovery profile,” will feature 15 galleries. It will be dedicated to art from the period between 1917 and 1987 and present important artists from the historical avant-garde that have been underestimated, overlooked, or unduly forgotten. Among the exhibitors in this section are Timothy Taylor Gallery (London) and Galerie carlier / gebauer (Berlin), both new galleries to the fair. This section will feature works by artists such as Roy DeCarava, Bob Law, Barbara & Michael Leisgen, Véra Molnar, Yuko Nasaka and Eduardo Terrazas, building a bridge between artistic practices of the present to those of the past. PRIME will comprise 98 established galleries representing internationally established artists. Newcomers to the section include Pace Gallery (London), Galerie Peter Kilchmann (Zurich) and Ben Brown Fine Arts (London). Returning galleries include Xavier Hufkens (Brussels), Bernier/Eliades (Athens), Galleria Continua (San Gimignano, Beijing, Les Moulins and Havana), Almine Rech (Paris, Brussels, London), Nathalie Obadia (Paris, Brussels), Axel Vervoordt (Antwerp, Hong Kong), Marlborough Contemporary (London), MOT International (London, Brussels) and Waddington Custot Galleries (London). DISCOVERY will feature 30 galleries representing emerging artists whose work is not yet known to a wider public, including galleries such as KOW (Berlin), Barbara Seiler (Zurich) and Green Art Gallery (Dubai). For the first time, this section will present booths by Temnikova & Kasela (Tallinn), Ellis King (Dublin), Château Shatto (Los Angeles), The Sunday Painter and Arcade (London), àngels (Barcelona), Document Art Gallery (Buenos Aires) and General Store (Australia), amongst others. As always, Art Brussels continues to place emphasis on the individual presentation of artists with 25 galleries presenting projects in SOLO. Exhibitors include New Art Centre (Salisbury) with Toby Ziegler, Sorry We’re Closed (Brussels) with Yann Gertsberger, Baró (São Paulo) with David Medalla, Shoshana Wayne (Santa Monica) with Dinh Q. Lê, and MOT International (Brussels, London) with Marinella Senatore. 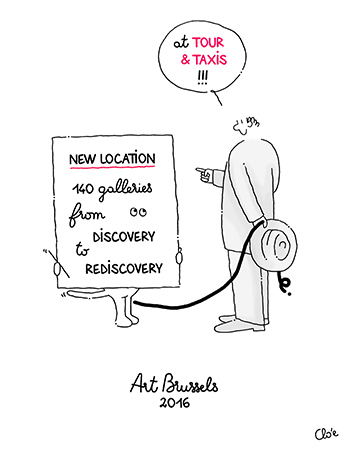 The full list of exhibitors at Art Brussels 2016 can be viewed below and on www.artbrussels.com. The members of the selection committees can be viewed here. Art Brussels thanks its main partner ING for their ongoing support. ING will present a site specific installation by Peter Kogler.